HALT and 100 Women Who Care - H.A.L.T. 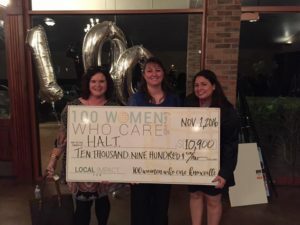 There is a fabulous new organization in Knoxville that started last spring called 100 Women Who Care. Like HALT, sometimes the simplest idea can have a big impact. When I was first notified that HALT had been nominated over the summer, I had not heard of them before. When checking them out online what they did seemed too simple. Members get together quarterly. They each bring $100 to donate to a non-profit, and each quarter a non-profit gets the donation of $10,000. The person that nominated us was not someone I or other folks in HALT knew. She found us through the community, and nominated us because we work with both dogs and at-risk teens. Both kids and dogs in need are important to her, and she loves what we are able to accomplish with our program. The idea is a giving circle of local women who want to make an impact in their community that may not have the time to volunteer themselves. Groups are popping up all over the world. To be a member you commit to donating $100 per quarter to the non-profit group that wins the group vote. There can be more than 100 women in a community group. More members = bigger donations for charities. It’s a way for your donation to be part of a collection of donations that can make a big impact to the group that gets it. The Knoxville group has been one of the fastest growing branches. Current group members nominate 501(c)(3) non-profit organizations in their community. Each quarter, 3 nominated organizations are picked from a random drawing to present at the next meeting. In one hour the nominees share their programs in a 5 minute presentation, a short Q&A session follows, the members discuss and vote, and the winning organization gets the donation. Organizations that aren’t picked the winner go back into the hat (literally) for the next quarter’s drawing. That’s so simple! I was notified in October that HALT had been drawn from the hat as one of the 3 organizations to present at their November meeting. I went to the meeting a bit nervous, but HALT is something I’m very passionate about, so it would be easy to talk about (and hard to keep me to 5 minutes). In talking to some of the women in attendance before the presentations, I learned that the concept really is that simple. Many people have busy lives with family, kids, and work and don’t have time to volunteer their time, but they want to help. They want to contribute and make a difference. I was there with great company. The other two organizations were also very deserving. The Knoxville Jewish Alliance is expanding their work with Autistic kids, and Helen Ross McNabb Sexual Assault center providing care and therapy for survivors of sexual assault. 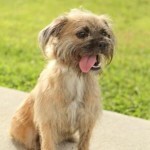 Through the Q&A I learned that one of the ladies had adopted Harry from fall 2013! She shared with the group how much they loved the letters they got from the kids that had worked with him. Another lady was the one who sponsored Buddy through the spring 2015 class. In the end, H.A.L.T. won the vote!! They had a big check and members came up to take pictures with me. The donation that night was almost $11,000 from those in attendance, and after the rest of them came in the weeks that followed, the donation topped $15,000! Such an amazing group of women, and what a difference they can make with an hour of their time. We have wanted to build a shade structure over a section of our training area for several years. We will be able to build this and do some other grounds maintenance with this donation and not have to get into our regular operating budget. We are extrememly grateful.